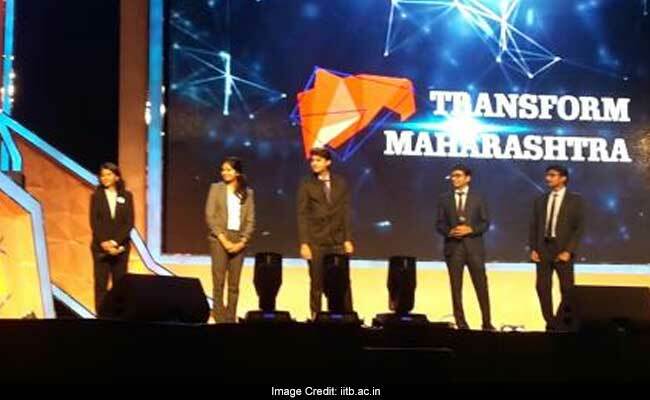 New Delhi: Indian Institute of Technology (IIT) Bombay students are awarded for their solutions on socio-economic challenges for 'Transform Maharashtra' campaign. Students from IIT Bombay won first prize for solution on the theme 'Jai Kisan: Drought-Free Maharashtra' and second prize for their solution on 'Clean Slate: Swachh Maharashtra', said a statement from IIT Bombay. IIT Bombay students have also won second prize for solution on 'Smart & Smarter: Development Of Sustainable & Liveable Cities' and another second prize for their solution on 'By The People: Citizen Engagement In Governance, In the Judges' Category. 'Transform Maharashtra', is a an initiative led by Chief Minister Shri Devendra Fadnavis, as a part of his efforts to engage the youth of the state in governance and create a road-map for developed Maharashtra by 2025. It is a state-wide competition that invited solutions from college students across state to the 11 socio-economic challenges faced by Maharashtra. The competition was launched by the Chief Minister in December 2016 during Mood Indigo Festival in IIT Bombay and has touched around 4,00,000 people (including 15,000 participants) so far. Indian Institute of Management Nagpur (IIM Nagpur) students also joined 'Transform Maharashtra' initiative. The competition witnessed around 2500 submissions from around 15,000 students across Maharashtra.